Summer is always a time of change at Home-Start Ashford & District. Volunteers visit less as many of them have school age children of their own and families fill their days with play dates and holidays. The wonderful weather this summer has made events much more accessible for everyone, lots of garden and park fun which is easier for parents and pocket. We held two really successful summer events, free to families and volunteers. Our annual trip to the Rare Breeds Centre, Woodchurch was supported by the Rotary Club of Ashford Earlybird. Everyone enjoyed a sunny day at the farm meeting the animals, enjoying the outdoors, tractor rides and a picnic. 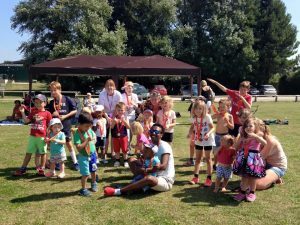 We also celebrated the Rio Olympic with a sports day. Using the wide open space (and toilets) of Bromley Green FC and equipment supported by Jenny Webb, Ashford Borough Councillor for Norman Ward, families took part in races such as egg & spoon, sack, skipping and three legged. The weather was scorching but thanks to Kennington Community Forum we had a spacious gazebo to offer some shade. 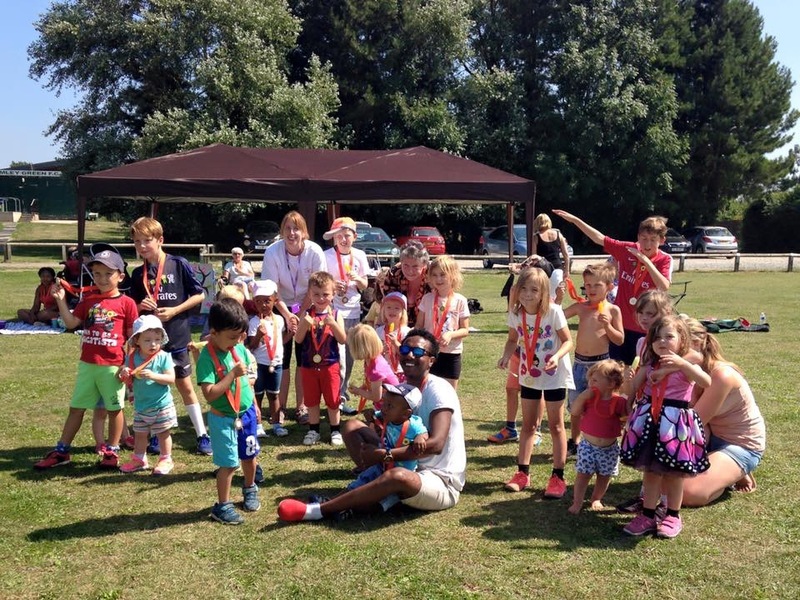 Everyone had a great time being rewarded with medals and ice lollies. Chill with Dad has celebrated the birthday of Eric Carle by having a Hungry Caterpillar session at the library and had a trip on the Romney, Hythe & Dymchurch Railway. Dads have taken part in a session on keeping up with your childs maths and a summer survival evening. Our Moving On group is going from strength to strength with a steady attendance of families. 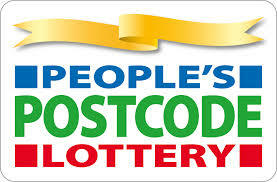 Fantastic news came our way, our funding application to the People’s Postcode Lottery was successful. This money will be used to update and refresh our Volunteer Preparation Course. The course is run over 8 sessions and includes topics such as Expectations & Boundaries, Confidentiality, Safeguarding Children, Equality & Diversity and Personal Safety. We are eager to start a new course on 26th September using updated material an session plans. This is only possible thanks to the People’s Postcode Lottery and all those who play. Looking forward to the next weeks and months leading up to Christmas there’s lots to be excited about. In September we host our AGM and as mentioned start a new Volunteer Preparation Course, we are also planning a volunteer residential training event. This event not only has two exceptional trainers facilitating training days but also gives volunteers an opportunity to come together in a relaxed setting, get to know each other better and share experiences which leads to a greater support network within the scheme. October we are organising an after school play activity and November we will be out drumming up sales of tickets ready for our Grand Prize Draw in December.